Aluminium Trays Direct has been manufacturing a range of quality, stylish and long lasting Aluminium ute tray bodies for 1 tonne utes for 15 years with a system that has only changed once in more than 25 years. All aluminium construction which means lighter weight and greater payload. Also great for beach work - no rust. No side or rear lip makes for easy loading and unloading. 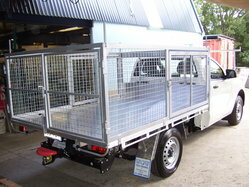 250 mm high sides and tailgate. Smooth dropside and tailgate panels, ideal for signage. Aluminium hinges - no rust. Smooth shaped one piece headboard. Other headboards available if required. 22 mm diameter hinge bearings for longer life and no rattles. 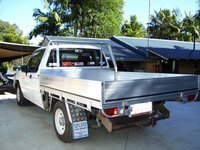 Aluminium catch plates and dropside end caps - no rust. Adjustable dropside catches have nylon wear bushes - no rattles. Strong rope rails can take extra load with tie downs. Will not bend. Box section side and tailgate panels, no buckle and bend with load tie down. Tail light protectors as standard. Because we hand build our trays we can adjust width and length of trays to suit your vehicle as long as it is legal. Aluminium main rails and mudguards. 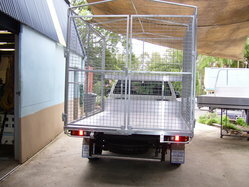 We also manufacture cages for delivery drivers and ute hire vehicles. Cages are usually 900, 1200, 1500 or 1800 high. 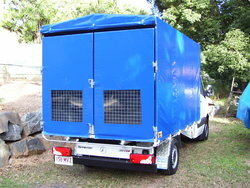 They can be fixed or removable and we can arrange for tarps to be fitted. Normally they have 2 rear opening doors. If required we can make side opening doors either pallet size or parcel size. A rear step is also available. 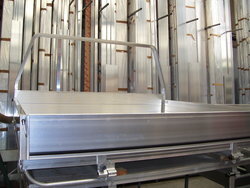 We can repair most Australian made aluminium trays and work closely with many panel beaters and crash repair shops.